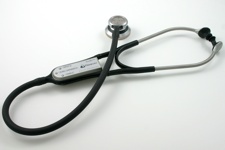 Thinklabs stethoscopes are proving popular in use. You may still find some Thinklabs ds32a+ for sale but the current model is the Thinklabs One. Both are versatile and the closest to “one size fits all” we have in the UK at the moment. The input/output socket is suitable for headphones and can also be used with hearing instrument accessories such as induction silhouettes (T setting), direct audio input and FM or Bluetooth streamers. But it is better to use earpieces or headphones if possible to avoid the problem of poor low frequency reproduction. You can also connect headphones or another Thinklabs stethoscope to allow dual listening. The Thinklabs stethoscope connects to iPhone, iPod, digital audio recorders or computers to record sound and there’s an iPhone/iPod app to produce a visual display. Conventional stethoscopes transmit sound by air conduction through the tubing, leading to some attenuation. The Thinklabs stethoscope transmits sound electonically along wire in the tubing to speakers in the earpieces. So if I’ve understood right, the earpieces are electronic and I don’t think it can be used with adapted earpieces. But it may be possible to adapt conventional BTE moulds to accept the stethoscope’s earpieces. It also has noise reduction features. The headpiece arms are adjustable, useful if you find the pressure in your ears or on your hearing aids from conventional stethoscopes uncomfortable. Make sure you read the instructions carefully. You can set different filters and also adjust frequency response by the changing the pressure on the diaphragm. This helps bring out specific heart or lung sounds while filtering out others. And see how your audiogram matches up to heart and lung sounds to find out whether you need amplification or not. Don’t forget, hearing aids don’t usually reproduce the low frequencies well. So if you’re using earpieces, custom moulds or headphones over hearing aids you also need vents in your ear moulds or open fitting. 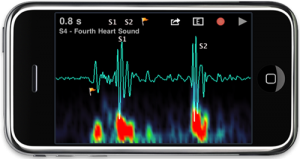 Certain electronic stethoscopes can link to hearing aids using accessories such as the T switch, direct audio input (DAI) cables or even FM or Bluetooth if your hearing aids have these facilities. However it is better to use earpieces or headphones if possible to avoid the problem of poor low frequency reproduction. Hi, I have bilateral cochlear implants. Would I be able to plug on my own headphones cable that then plugs straight into my implants? Crucially, heart and lung sounds are mostly much lower frequency (ie pitch) than speech sounds. Hearing aids and implants are set up for speech. You need to show your audiologist the information at Do I need amplification? and Limitations of hearing aids and implants. Ask them whether your implants will reproduce these low frequencies. You may need a new programme setting up on your implants for using the stethoscope. Also, if you are using headphones, these must also have a good low frequency response. It’s no good your implants being set up right if the headphones aren’t transmitting the sounds properly. More information about headphones here and Thinklabs also mentions some suitable models here. Thinklabs has a chart of options with different categories of hearing aids and implants here. Where is this sold in the U.K.? Can it be trialled with a baha4? I haven’t yet heard of a UK supplier but you can buy direct from Thinklabs in the US. Read about VAT and import duty-exemption and about ordering equipment from overseas. If your unaided low frequency hearing isn’t enough, then you may be able to use the stethoscope with your BAHA. Either with a streamer or direct audio input cable or possibly on T setting with ear hooks (neckloop probably wouldn’t give a strong enough signal). But you’d need to discuss it with your audiologist. Show them the information about frequencies of heart and lung sounds. You may need a programme setting up on the BAHA to use the low frequencies and it will depend how low the BAHA can go. If you can’t get an audio setup, you can use the Thinklabs One with visual display. Check with Thinklabs about a trial period. It’s likely to be a month. I’m not sure if they would pay for return shipping though. So if you’re being funded by your employer or by Access to Work, make sure they’ve agreed to cover the cost of return if it doesn’t work out for you. Feel free to get back to me if you have more questions. Either here or use the contact form if you prefer somewhere more private. I expect it can and the quality would probably depend on the quality of the audio setup you use. You’ll be best off asking Thinklabs direct. There’s a contact link on their website.